Solaris was one of the films offered for critical study on the WJEC A Level Film Studies course. The notes below were written for a course on ‘Speculative Fiction’ in 2001. The novel Solaris by Stanislaw Lem was published in 1961 and as such stands as a much more sophisticated narrative than most Western science fiction could manage at the time. Lem wrote as a Pole and although familiar with Western SF also drew on the ‘philosophical writers’ of Eastern Europe such as Franz Kafka. The first English language translation of the novel appeared in 1970. The Russian film version followed in 1972 and as such was taken to be a riposte to Kubrick’s 2001 – A Space Odyssey, even though it drew upon a novel already ten years old. According to some sources, director Andrei Tarkovsky did not involve Lem in the screenplay of the film. The screenplay adds sequences that refer directly to Earth and the origins of the protagonist Kris Kelvin and his family home, a familiar image from other Soviet directors such as Dovzhenko. The novel is set completely in space. Tarkovsky was one of the few post Second World War Soviet directors to gain international recognition. His first three features after leaving film school (he had previously studied Arabic and worked as a geologist, unusual experiences for a filmmaker) all gained major international prizes. Solaris was his third film, but the first to get a UK release. It was followed into release by his second film Andrei Roublev, the story of a legendary icon painter which had difficulty in obtaining an export licence. Tarkovsky went on to make The Mirror (1974) and Stalker (1979) (also a science fiction influenced narrative) in the Soviet Union before moving abroad for three more films before his death from cancer aged 54. Tarkovsky’s method tended to eschew ‘montage’ and to use relatively slowly paced long takes in a process of ‘sculpting time’. This became more pronounced in his later films which tended to attract small, but very enthusiastic audiences. In his later career Tarkovsky became synonymous with the popular view of the arthouse director, but Solaris represents a more accessible work. Lem’s book is a classic of science fiction and Tarkovsky stays fairly close to the narrative of events aboard the space station. The main difference between the two narratives is the concentration in the novel on a satire of academic research – Kris refers to a series of theoretical ideas about the planet Solaris. Tarkovsky is more interested in the impact of the planet and its ‘living ocean’ on Kris himself. Although obviously taken with Lem’s story, Tarkovsky wanted to use the visual and aural power of cinema to the full. Even so, he maintains the central focus of the novel – the metaphysical questions about science and conscience – rather than developing the narrative into a mystery or a thriller. In this sense, Solaris represents a genuine attempt to create an ‘sf’ film. Solaris, both as novel and film, belongs to one of the major narrative groups of science fiction – stories about the first contact between human beings and aliens. Such stories can be divided into two groups. The ‘alien invasion’ group sees Earth visited by aliens, who are usually portrayed as aggressive and are ultimately defeated through the application of specifically ‘human’ knowledge and personal qualities. These stories were introduced by H.G. Wells’ The War of the Worlds. The second group, common since Flash Gordon battled Ming the Merciless, sees humans meeting aliens in space. In both groups of stories the emphasis is on the humans’ response to an alien ‘threat’ (although occasionally the aliens are benign). It has been argued that the difference in Solaris is that more time is spent on the question of how both human and alien intelligence feel and then react to the meeting. How does the alien intelligence react to encounters with humans? How can human cultural activity explore such issues? Tarkovsky links this question to that of the ‘second chance’ – having your time again. In 1973, the year after the completion of Solaris, Tarkovsky spoke about the film with a Russian interviewer, Z. Podguzhets. The text appears in Kitty Hunter-Blair’s book, named in the footnote to this section. This is my summary of part of the text. Please note, I use “man” here in a generic, not gender, sense. As Tarkovsky read it, the key to Stanislaw Lem’s Solaris was not the technological sophistication represented by space travel, but “the moral problems evident in the relationship between Kelvin and his conscience”. The spiritual implications of technology were more important to Tarkovsky than the technology itself. He described two opposing forces influencing man: one, a yearning for complete moral freedom; two, the search for meaning in his own existence. The inevitable result was a deep inner conflict and a battle with conscience, which Lem expressed through the relationship between Kelvin and his wife, Rheya, summoned back to physical form in station Solaris. Surrounded as he is by the ultimate products of technological achievement, with which he pursues his urge to explore the universe, Kelvin can do nothing to avoid coming face to face with the implications of his own past actions. Kelvin can never distance himself from the forces that shaped his own development. However far he journeys, he will ultimately be drawn back to his own roots. Even at the limits of human endurance, Kelvin is a creature of the earth and the people who gave him existence. The dream of returning home and eradicating the mistakes of his past lies at the core of Kelvin’s being, but it takes an alien intelligence to perceive the dream. Yet that alien intelligence, too, is subject to whatever laws may govern the universe. The inescapable fate bestowed by a spiritual, moral existence is to live with the conscience that arises from the actions a person takes, with no prospect of a second chance. Kelvin’s ultimate destiny is to return to the place where he was born. He can go nowhere else. Time Within Time – The Diaries 1970-1986, Andrey Tarkovsky, translator Kitty Hunter- Blair, Faber and Faber, London, 1994. Solaris provides us with a chance to discuss what kinds of questions science fiction can ask when it is not being ‘predictive’. These may indeed turn out to be philosophical, and even spiritual, rather than ‘scientific’. Why the title? In film and media studies, one approach to discussing the representation of social groups (and also ideas and values) is to suggest that there is often a dominant set of representations available that renders anything else as in some way ‘other’. A whole range of personal identities is thus seen in negative terms. Although women are more than half the population, cinema has been dominated by men so that women are presented as ‘other’. Part of this otherness is concerned with passivity. Women are often in front of the camera, to be looked at, whereas men are behind the camera controlling how women appear. When women become directors and cinematographers they move to the ‘other side’ — but does that mean that they automatically resist conventional ways of representing women (and men)? ‘Otherness’ is also an issue when considering cinema outside Europe and North America. Issues of ethnicity and religion and culture generally create questions of a ‘Non-Western’ other. 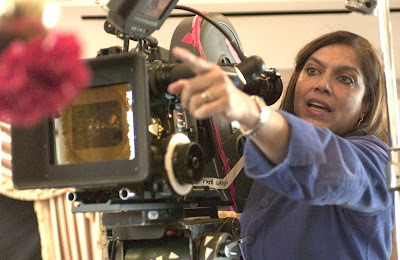 The class focused on women directors who are ‘doubly other’ because of gender and culture.